This 12 Million Volt self defense weapon is rechargeable and has a super bright, 3 function flashlight with 3 modes: a high beam, low beam, and strobe. A stun stick is really just another name for a stun baton. These self defense weapons are electrified and will deliver a powerful shock to the person you touch with them. Generally, the people who need the longer length are security personnel or those who encounter dogs along a walking or running route. The rubberized coating on the handle ensures a firm grip and the metal strips down the barrel of the stun baton release a hellish shock to anyone trying to take it from you. This 12 Million Volt self-defense weapon is rechargeable and has a super bright, 3 function flashlight with 3 modes: a high beam, low beam, and strobe. The flashlight can light up your way as you make your rounds and the strobe function can temporarily blind and disorient someone. The STUN MASTER STUN BATON has been a favorite among security guards because of its power and extended reach. You just have to touch an assailant with the baton and press the trigger: three-to-five seconds will leave the person dazed and temporarily paralyzed. Simply discharging it into the air will often times quell an overly cocky attitude. The stun baton will also deliver a shock when touched six inches from the tip due to the metal plates running down the sides. This prevents an assailant from grabbing it and taking it away. Rubber handle. 12" in length. Good for walking as it makes a great dog stun device if you are confronted with an aggressive canine. This powerful self defense device includes a hip holster that allows you to carry it on your side. It measures 12" x 1 1/2" and includes wrist strap disable pin, wall charger, and nylon holster. By giving you extended reach, you are able to keep an attacker or a dog away from you so they can’t cause you any harm. The shock stick is able to provide a safe zone that is further out than what you’d normally have if you had no other weapon with you. 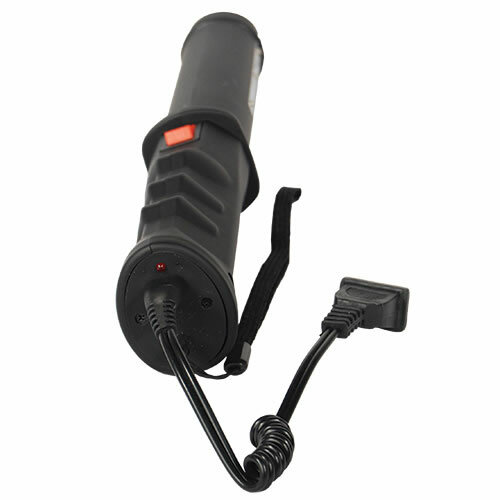 A shock baton can use batteries or be rechargeable and can vary in length. Some are mini versions which make it easier to carry on your side especially when walking or running. As a self-defense product, these are effective at warding off an attack. As most people are afraid of electricity, when they hear the crackle of the stick, they immediately don’t want anything to do with it. Just like regular stun guns, the sight and sound of the electrical discharge can be intimidating. Dogs especially do not like the sound of electricity and by simply discharging the weapon, most canines will stop in their tracks and not come any closer. Great product, worked right out of the box. Definitely feel more secure about having it in my car on my road trips and hiking excursions. Love how easy it is to use and fits in my hand perfectly! Great product. It was exactly as described. I will reccommend it to my friends!